How to select the best Pillow for Reading in Bed? Sometimes it’s not enough when you’re lying down and reading a good book, and you want to experience some extra comfort. It’s natural to want to lay down when reading, as sitting up for a long time can cause strain on your neck as well as make it very difficult to focus on the words on the page. Additionally a regular pillow may not be able to give you the comfort you require for reading when laying down and may even cause you to become a bit drowsy; a definite hassle when you’re trying to read. However, to remedy this there are reading pillows that not only provides comfort but also support for your reading moments. What should I consider when selecting a reading pillow? There are a number of different factors that come into play when considering the best pillow to use when you’re in the mood to read but not necessarily in the mood to sleep. It is important to keep these in mind when selecting the pillow, but also possible to consider that you can still use the pillow for resting. Posture is an important attribute to consider when selecting a reading pillow that will allow you to do multiple tasks without any pain or stress. The posture you want to keep in mind is the posture you maintain when you are using the pillow for whatever tasks you want, be it reading or anything else that requires you to lay down or sit. You will want to ensure that you have ample support for your neck, head and back, with priority in that order. You’ll mainly notice the feeling in your head first before all others. Offering strong support for your head will ensure that you have better support for your neck and back, an important aspect to consider when you want to read comfortably. Neck support will ensure you are not feeling any pain after prolonged use, which can cause additional problems when trying to use other objects such as a regular pillow or even just general movement. This allows you to rest comfortable and read comfortably without any prolonged pain. It should not inhibit the movement of your neck. Comfort is a given when considering any form of item that relates to your head. The materials used should be soft but also slightly firm so that your head does not sink in. You will also want to ensure that your head is elevated to the point where you can read comfortably without much strain on the rest of your body. Additional features are just as they imply; additional. Having these features are not essential but can vastly improve the experience you have when using your reading pillow. You may want to have side arms to allow you to better read when sitting up and using the reading pillow for more than just reading when you’re laying down. You may also want to consider a pillow which has the capacity to be used as a sleeping pillow. You will however need to investigate the materials as well as the shape used, as the shape for a reading pillow may not be as comfortable as a sleeping pillow which you are used to. Regardless, it can still offer many benefits and give you additional uses. The color of the pillow is one of the last features that you should consider but not give too much thought to. In this day and age the color of an item is usually a feature that is merely given to let you make a simple choice that does not have any effect. It should have no bearing on the way the item works at all. Obviously you should go for a color that you like, however it is important not to discredit a reading pillow that has all the features you want but does not have the color. It would be better to go for functionality over design, as you want the best and most comfortable pillow; not the most colorful. What are some good pillows for bed reading? This pillow offers both head and back support, allowing you to read when you’re laying down or with your back rested against a wall. 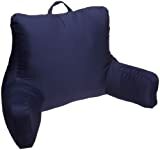 It’s also a multi-purpose pillow, so you can use it for more than just reading; such as watching television. Additionally it has armrests for added comfort, an easy to lift handle as well as the ability to spot clean. Created from 100% polyester, this reading pillow offers multiple levels of support to provide extra comfort in multi-positions. The head rest helps to keep your head in a comfortable position whilst you read or watch tv and the versatile design allows it to be used as a bed wedge or even a sleeping pillow. 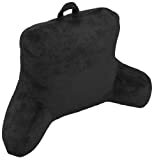 Touted as being an excellent pillow for reading as well as lounging, watching tv or playing video games, this pillow allows you to rest with ample support for your head, neck and back. Additionally it has an easy to carry handle as well as the ability to spot clean, adding a hygiene factor to its use and allow it to be kept nice and clean. Hopefully with all of this information in mind it should be a simple task when selecting the best reading pillow that is appropriate for you. Remember to consider all your options and go for the pillow that you like the best; one which offers a whole range of features as well as comfort and support so that you may read in peace.